Shirou wakes to Kuro sleeping in his bed, leading Ilya to slap Shirou as a result. As Shirou makes breakfast, Ilya is still offended, but when Kuro offers to make him something special in cooking class, Ilya gets in on the act. 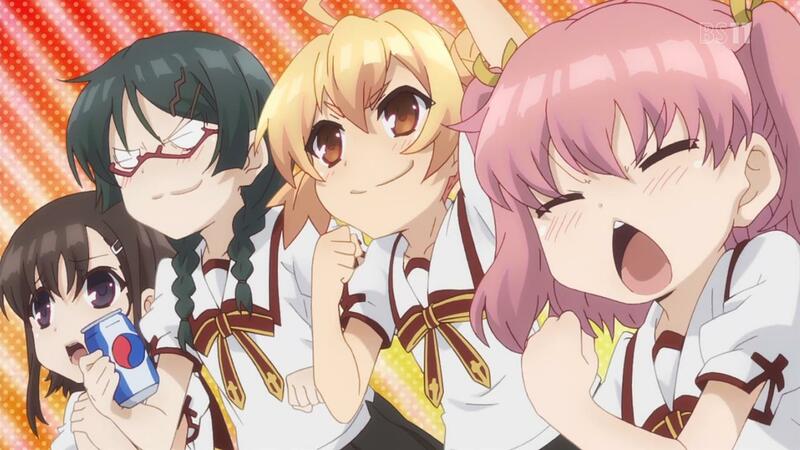 Kuro gets teamed up with Miyu and Mimi, making her cooking team superior. 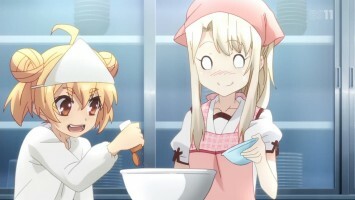 Ilya has Nanaki, Suzuka, and the dangerous Tatsuko, who could put anything into the dish they are preparing. True to form, she adds nutmeg to their recipe for making a pound cake. 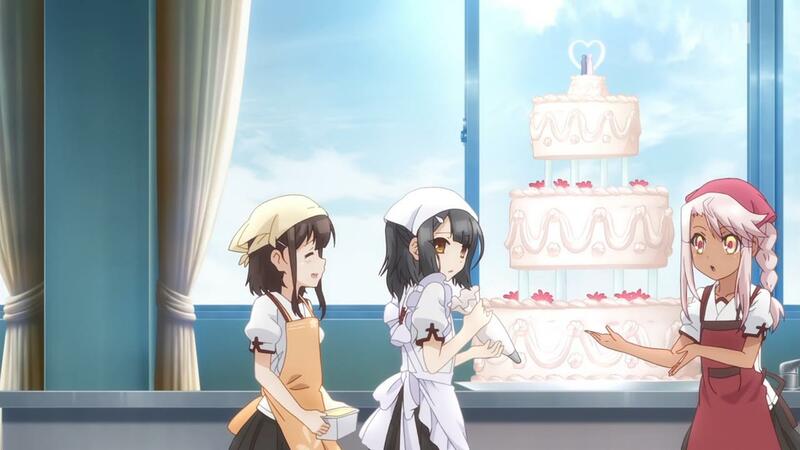 Mimi makes the pound cake on Kuro’s team, and Miyu ends up making a giant wedding cake to Taiga-sensei’s chagrin. Ilya works hard to salvage their pound cake, but Tatsuko sabotages it again, this time with mint. At home, Shirou picks Ilya’s cake over Kuro’s, even though it tasted bad, sensing her efforts in it. With Kuro again sleeping with Shirou, Ilya decides the house rules should be followed, and Iri agrees, producing a chart with herself at the “god” level and Shirou at the bottom. This puts Ilya as “oneesan” to Kuro, something she relishes, but Kuro isn’t accepting so readily. At school, the girls invite Kuro to the party they are throwing for Ilya. Kuro says it is her birthday too, much to Ilya’s chagrin, but everyone is surprised with Miyu says this is her birthday as well. Ilya seeks advice from her friends on being a good older sister, then tries it out on Kuro, failing in the process. At home, Ilya is happy that Kuro bought her a flan, but then accuses Kuro of trying to be the older sister. As Iri quietly observes, Ilya and Kuro debate over who’s gets to be the older sister. This episode comes off as two stories for the price of one, and that’s not a bad thing, even if it was mostly fun filler. The first story covered the usual class cooking story in some anime and manga titles. It was amusing to me that Ilya (and thus Kuro) aren’t good at cooking. I remember Cardcaptor Sakura where Sakura was good at cooking and used magic to make it better. Of course Tatsuko was the scene stealer in this cooking battle between Ilya and Kuro. Although predictable, it was still funny to me how she sabotaged her team’s efforts because she thought it was a good idea to add nutmeg and mint to a pound cake. For the second story, the rivalry between Ilya and Kuro going up a notch to determine who’s going to be the older sister (and thus the one the other has to pay respect to) also made laugh. I was surprised to see Ilya in the pouf hairstyle, which I recently read about in volume 7 of Haganai. Is (or was) this some kind of fad in Japan? Speaking of surprises, I didn’t think Iri would still be at home. For some reason, I thought that at the end of the previous episode, she was gone. Although her role was small, I laughed out loud at her family organization chart, placing herself in the role of “god”. I like that she has an active interest in both Kuro’s and Ilya’s lives. Shirou gets the worst in this episode. Not only is he at the bottom of Iri’s chart (as an older brother), Ilya slaps him twice for Kuro crawling into his futon. He just can’t buy a break. The only item of interest on a larger plot scale is the reveal that Miyu’s birthday is the same as Ilya’s and Kuro’s. Since she’s referred to Shirou as “oniichan”, it really makes me think that she’s some alternate universe version of Ilya for some reason. Or maybe it is better to say an alternate version of what Ilya was to be — the Holy Grail. In the end, this was a pretty funny episode and a lot of fun to watch. Looks like the plot comes back into focus with the next episode. I’m looking forward to that. So… a bit filler time. This episode covers chapter 11 and 12, though in reverse order. That’s not actually a bad idea in this case. That complaint probably comes too late, but I can’t stand Shirou’s design in the anime. His face looks ridiculous. I don’t understand why Silver Link didn’t try to make him look more like in the manga. I actually wonder why Kuro didn’t attempt to use her card’s powers, I mean, her Heroic Spirit is an expert housekeeper and cook! Some of the scenes looked like they were taken from these cooking anime like Sokugeki no Soma, haha. That was a very funny chapter. Only disappointing part is that flashback, which they shortened. 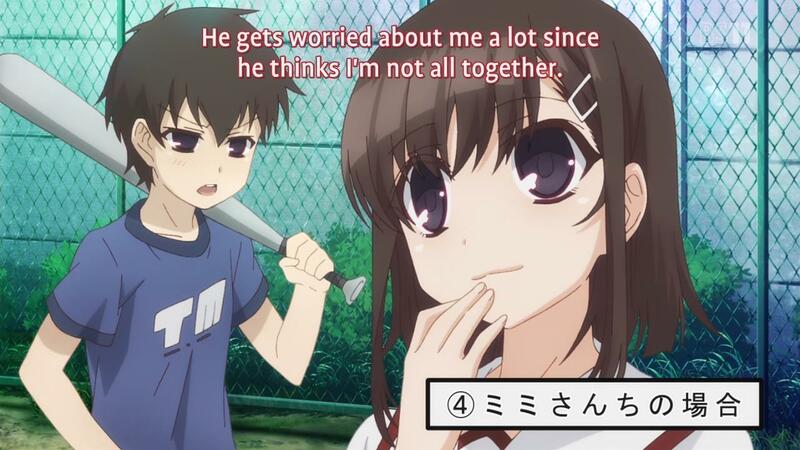 This is one of the rare Shirou/Ilya scenes and shows how deep their bond can be. 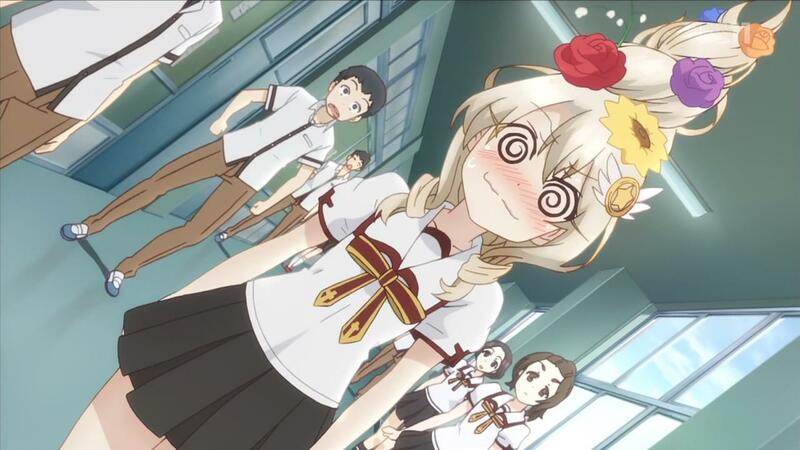 But damn, does Ilya look cute. Kinda strange to see Kuro boldly showing her attraction to Shirou. 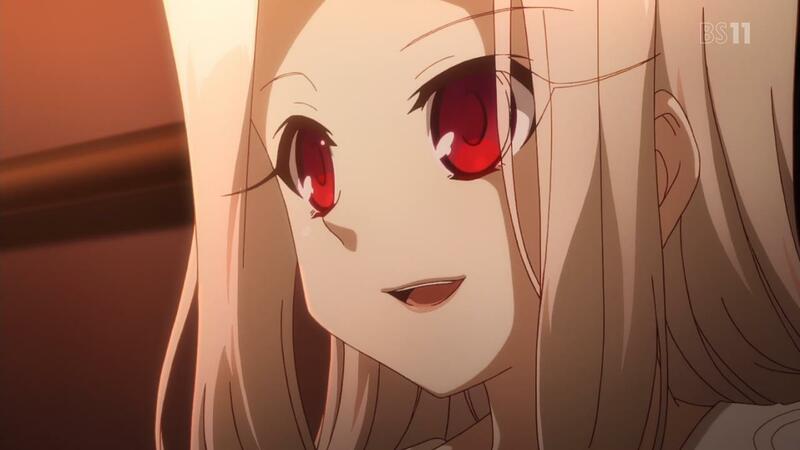 Then again, she is the original Ilya, and FSN Ilya never hid her attraction, so that makes sense in my opinion. As for the second part, lol the references don’t stop. This pic here (http://i.imgur.com/ubtgcVWl.jpg) shows some of the more famous older sisters in Type-Moon’s works. 1. From right to left, the first one is of course Kohaku/Ruby incarnate from Tsukihime. 2. The purple haired girls are Fgurab naq Rhelnyr, Evqre’f, Zrqhfn’f, byqre fvfgref. Gurl qba’g nccrne va SFA, ohg gurl qb va Sngr/ubyybj ngnenkvn (uggc://v.vzthe.pbz/4EN992O.wct). 3. 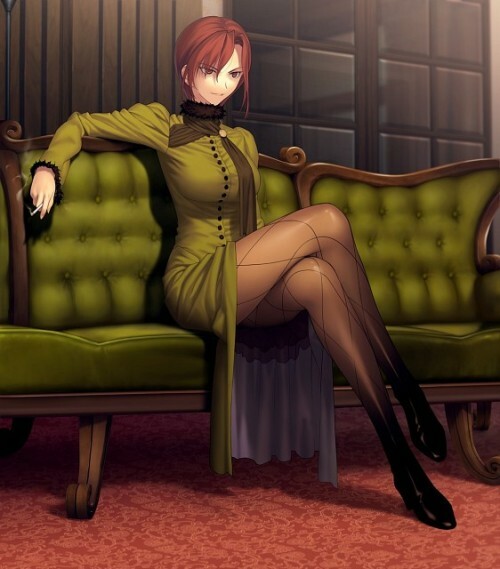 The last one is Aozaki Touko from Kara no Kyoukai and Mahou Tsukai no Yoru. Her KnK design was used in the manga (well, you didn’t see much), Silver Link used her Mahoyo design instead (http://37.media.tumblr.com/e6effe59c0e9ffeb8db2266f34eedce6/tumblr_mgwyqwVSS81rjt84no2_r1_500.jpg). Touko is the older sister of Aoko, who makes an appearance in Tsukihime and is also the protagonist in Mahoyo. It’s true that Touko is the superior magus in the family, she is an expert in lots of things, but considering the fact that Aoko is one of the remaining Magicians/Sorcerers in the world… If we’re talking about being affectionate towards the younger sister, only Kohaku really fits. Well, I’d say one of the few older sisters that are missing is of course Rin, but that would be an unnecessary spoiler I guess. Luvia also counts as Rin’s “sister” if we are nitpicky (if it’s true that Rin possesses the other Edelfelt Magic Crest – the Edelfelts’ Sorcery trait is called Ore Scales, but another name for it is Sisters). But who would be the older sister…? It’s funny Ilya says that, when she’s actually older than Shirou in FSN. And goddammit, Rin and Luvia are causing a popularity war in their high school. Poor Nanaki’s older sister. Btw, I have to say, I am glad Silver Link didn’t forget all the references Hiroyama has hidden in the manga and they even made some of them more apparent, haha. Mimi’s brother is wearing a Type-Moon shirt (http://i.imgur.com/X8P5fIQ.png / http://i.imgur.com/gWJIx1u.jpg). So… who’s the older sister? I think it’s Kuro: she already demonstrated her powers (she’s stronger than Ilya), she buys her sister flan and she just displayed tsundere traits! 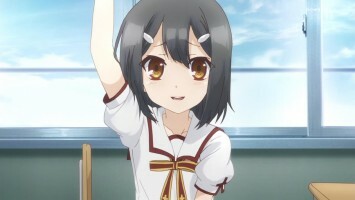 Well, she’s also eight months older… and she is actually wiser and more mature than Ilya. 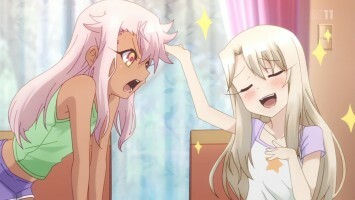 That’s not hard though, Ilya is still a child after all and Kuro was tempered with magic and knowledge by the Einzberns. Last thing to add, the OST is as always a giant nod to the FSN VN OST. I actually listened to the whole OST they released last year and noticed how many tracks were left unused, but are used now in this season. Last episode had a subtle arrangement of Church on the hill/All the World’s evil (https://www.youtube.com/watch?v=rvTpZgiw5Rc) if I’m not mistaken. Like last season, an Ever-Present Feeling arrangement (https://www.youtube.com/watch?v=PjTixX43liw) is used for emotional scenes and at the end of the episode, before the credits, a New Dawn (https://www.youtube.com/watch?v=oJDruxCOvpw) arrangement was played. Then again, she is >/i> the original Ilya, and FSN Ilya never hid her attraction, so that makes sense in my opinion. Using the card power is a 100% release generally… You manifest all of the cards power or a fragment and that would be a weapon. Why exactly are you telling me that? When I said Kuro should have tapped into her card’s power, I was obviously joking. Incorrect. 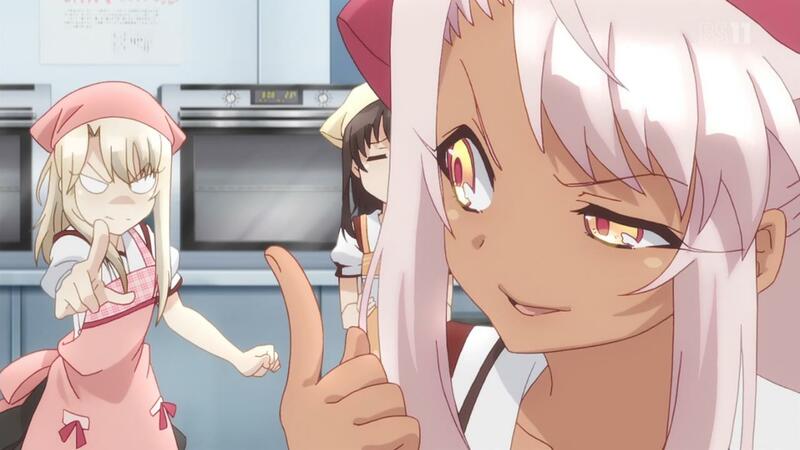 Prisma Illya’s demographic audience is seinen, meaning it’s aimed at mostly young adult men. It airs pretty late in Japan. This is a serious question: Have you played Fate/hollow ataraxia? Did you understand what I meant when I said Luvia and Rin are “sisters” (quotation marks were on purpose)? Because their families are probably connected through their Magic Crests, since the Tohsaka Magic Crest most likely acquired the Magic Crest of the younger Edelfelt twin. Gandr is a Scandinavian curse and Rin’s gandr is as good as Luvia’s one for an unexplained reason. To elaborate why Prisma Illya is seinen: The manga’s main audience consists of those who played Fate/stay night, which at the beginning was an eroge aimed at men and the updated Realta Nua version still got an age rating of 15+ meaning it is on the border between shounen and seinen. 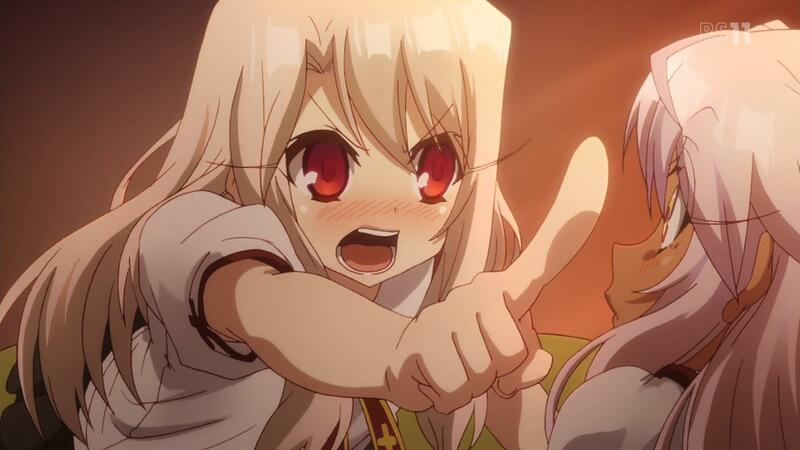 Prisma Illya’s fanservice, both loli yuri action, pantyshots and what else and its constant references to FSN as a spinoff, make it blatant that it is mostly aimed at FSN fans – the male half – and the anime doesn’t change that. 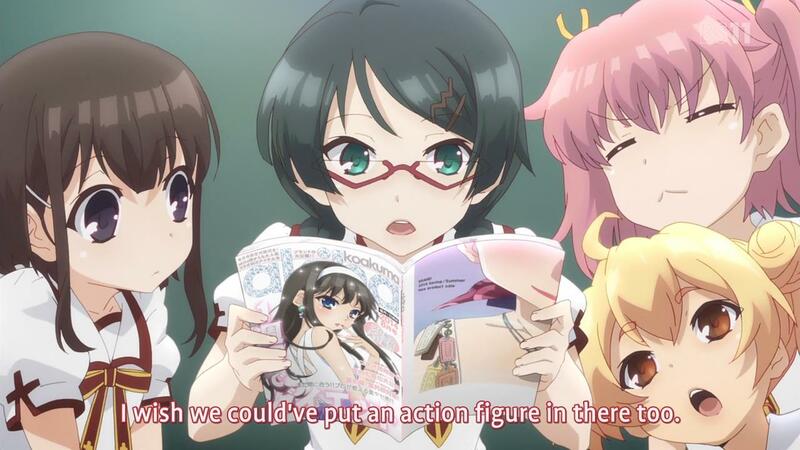 Madoka Magica is also a Magical Girl series, but the demographic audience is also mostly seinen. 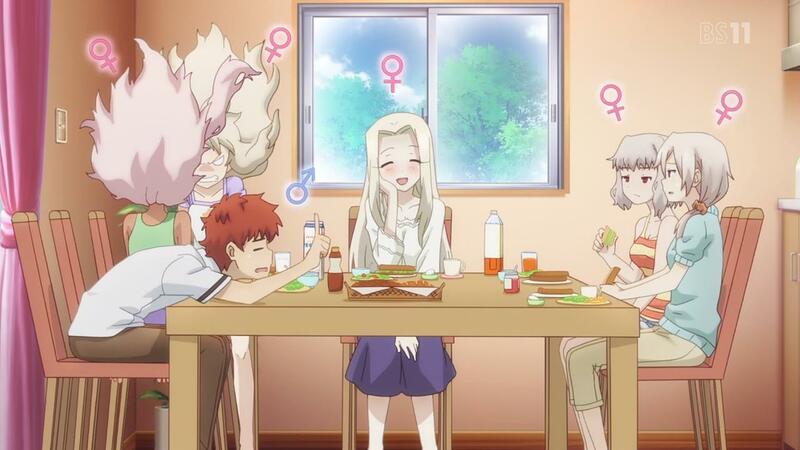 Demographics can’t be a good reason why Shirou’s face looks just awkward. He didn’t look that weird in the manga, either. I don’t know that I’ve seen how he looks in the manga since I’ve only read limited stuff based on links you’ve shared. Thanks for the info. I figured they were Type-Moon characters, but I couldn’t ID any of them. The purple haired girls are Fgurab naq Rhelnyr, Evqre’f, Zrqhfn’f, byqre fvfgref. Gurl qba’g nccrne va SFA, ohg gurl qb va Sngr/ubyybj ngnenkvn (uggc://v.vzthe.pbz/4EN992O.wct). I see that sometimes in official manga translations as well. I know when Genshiken came out officially in English, the translator (or adapter or editor) was apparently afraid of using the term “doujinshi” even though they eventually started using it. Yeah, I agree, though I got the feeling that the episode gave Ilya that role. You should actually blog the series and point out references/info from other Type Moon franchises. I would read the hell out of it.